Meet our new ‘my lab six’ ultrasound machine! 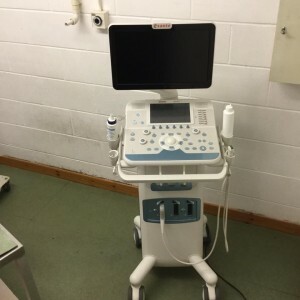 Meet our new toy our new ‘my lab six’ ultrasound machine! We are the first practice in Scotland and only the second in the UK to get this new generation of scanner! This replaces our previous scanner which was great but it was time for an investment in new technology! We use it mostly for diagnostic imaging and occasionally for puppy scans and it will take our diagnostics to another level! Puppies have fun at Donview Vets puppy parties! All the puppies had great fun at our puppy party last night. The puppies had a huge play session as their owners got a tour of the practice. Puppies and owners all enjoyed the party, apparently the puppies had a great nights sleep afterwards! Puppy parties are held once a month for puppies that have had their second vaccinations at Donview. Puppies get to socialise with other puppies, you get a tour of the practice and the Vets and Nurses up date you on the best way to care for your new family member. 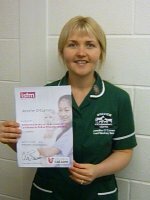 Jennifer O’Connor – feline friendly nursing certificate. We are extremely pleased to announce that our head nurse Jennifer has gained a certificate in Feline Friendly Nursing from the International Society of Feline Medicine. Jennifer has been studying hard over the last 6 months and has achieved distinction passes for all 6 units of the course, qualifying with an overall result of 93%! She would like to welcome our feline clients to contact her at our Inverurie practice for any advice regarding cat care, ranging from behavioural issues and environmental enrichment to dietary and medical queries.